Earlier this summer I posted a recipe for epic Volcanoes (dough that has been stuffed with scalloped potatoes, pancetta, caramelized onions, and cheese). These bagel bombs are kind of a spin-off/child version of the volcanoes. And they are absolutely AMAZING. Yes, capitalization is completely necessary. These are my favorite. I have made this recipe several times and I freeze the majority of them. A little heat up in the microwave or oven and you have yourself a quick breakfast or snack. But first, I need to tell you what these are actually made of! 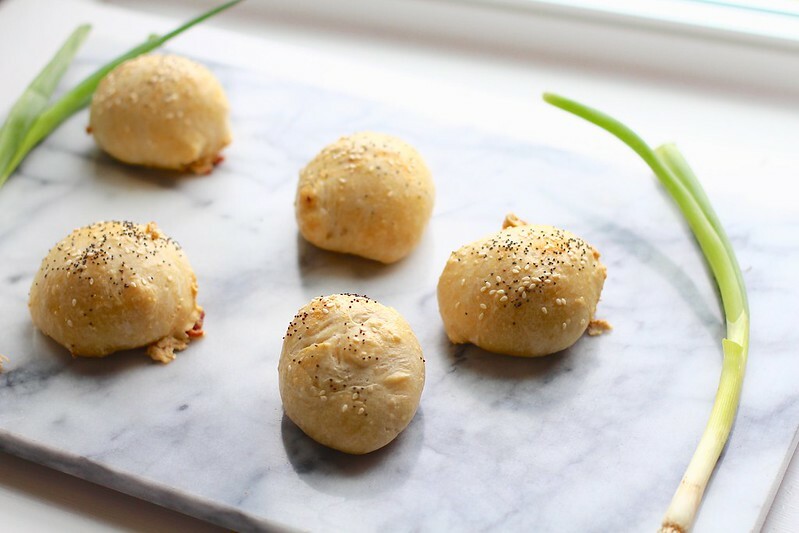 Bagel bombs are something that are completely new to me. I have never heard of them. Most likely because I don't live near any large cities, and I don't visit any all that often. Or maybe just because I am not visiting the right breakfast bakeries. Whatever the reason is, once I discovered these babies, I was totally hooked. These are unlike the circle bagels that you slice in half and toast then slather with butter. 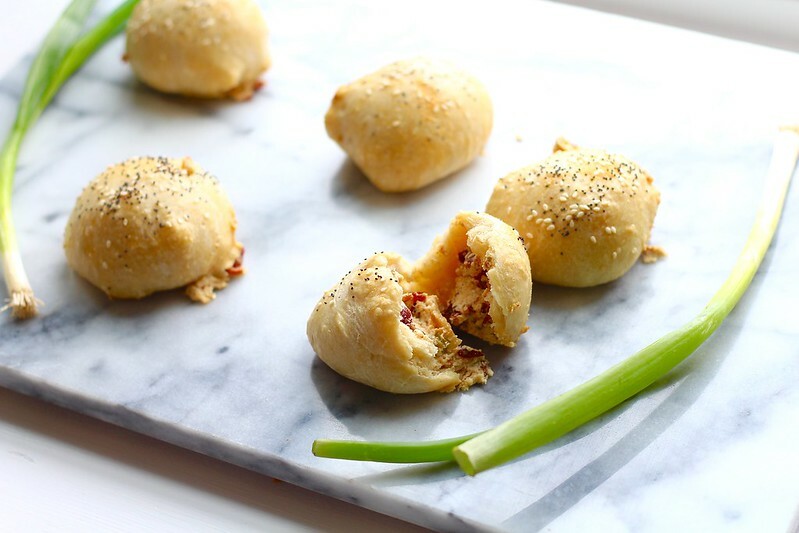 These are round bagels that are stuffed with cream cheese, bacon, scallions and topped with seeds. I mean seriously, after that statement, I feel like there is nothing more to say. 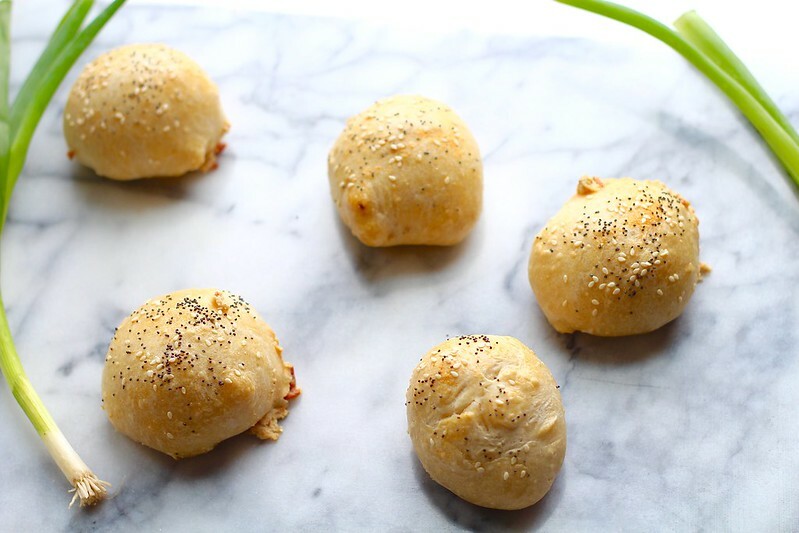 These bagel bombs do take a little time and work, but really, it is well worth it. You can freeze what you don't want to consume. Although, I think that once you eat one, freezing them won't be necessary, because you will want to eat them all! This uses the same dough from the volcanoes, so if you decided to halve that recipe, you have another dough half for these! I generally make a full batch, but only because I like to freeze the extras. Make a half batch first if you are skeptical, but I think you will regret it! Set some time aside this weekend and cook these up. These would make a great Sunday breakfast alongside scrambled eggs and a steaming cup of coffee. To make the dough, in the bowl of a stand mixer, whisk together the flour, salt and yeast. Slowly pour the water in, and mix with a wooden spoon until the dough is a shaggy mass. Fit the dough hook into the machine. Knead on the lowest speed, for about 7 about minutes, until the dough is smooth. Grease a large bowl with oil and place the dough in the bowl, turning once to coat. Cover with plastic wrap and let rise for 45 minutes before shaping. To make the filling, cook the bacon in a skillet over medium-high heat until brown and crispy. Remove from pan and place on a cutting board, reserving the bacon fat. Chop into small pieces. Place the cream cheese in the bowl of a stand mixer fitted with the paddle attachment. Turn the mixer onto medium speed. Slowly pour the reserved bacon fat into the cream cheese with the mixer on. Mix until combined. Scrape down the sides of the bowl and stir in the chopped bacon, scallions, sugar, and salt until combined. Scoop the filling into 8 small rounds and place on a small cookie sheet or plate lined with plastic wrap. Place in the freezer and freeze for 1 hour, or until hardened. To make the topping, mix together all the ingredients in a small bowl. Set aside until ready to use. When the dough has risen and all the components are ready, preheat the oven to 325ºF. Have ready a parchment or silpat-lined baking sheet. Divide the dough in half. Refrigerate or freeze one half for future use. Divide the remaining half of dough into 8 equal pieces on a dry surface. Using your fingers, gently stretch the dough into a 2 or 3-inch circle. Place a ball of frozen cream cheese in the center of each round. Pull the edges over the cream cheese and pinch together. Turn over and gently roll the seam on the counter until sealed and the dough is round. Place on the prepared baking sheet, seam side down, spacing 4 inches apart. Repeat with remaining dough rounds. Whisk the egg and water together for the egg wash. Brush the egg mixture over each bagel bomb. Then, sprinkle the topping over each bomb. Place in the preheated oven and bake for 20-30 minutes. The bagels should be just golden brown. Don't worry if cream cheese explodes out the sides. Serve as is, or stuff the cream cheese back in with your fingers. Serve warm. If freezing, let cool completely, individually wrap in plastic wrap and place in a freezer bag. Freeze for many months, warming before serving. *This makes enough dough for 16 bagel bombs. If you want to make that many, double all the filling ingredients. If you don't, freeze the other half to make more bagel bombs in the future and proceed as directed. ** When measurements are given, it's best to weigh the ingredients to ensure the best possible outcome for the recipe.